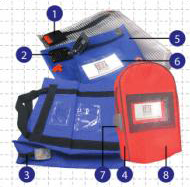 The reusable A4 Document Bag is specifically designed to secure confidential documents and sensitive information. The security bags are locked with an individually marked security seal which ensures high tamper evidence. The A4 Document Bag easily holds A4 paper folders. If bags are to be used for hardback files, the size can be customized. 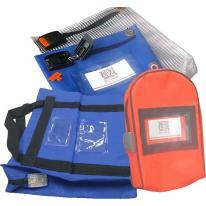 Handles and customized identification can also be added to the bags. 1. Zipper is fully enclosed in the locking chamber when the bag is sealed. 2. The locking chamber is riveted in 4 places. All the rivets are hidden inside the bag and inside the locking chamber, which make them inaccessible from the outside. 3. The zipper is reversed, so the teeth can only be put together from the inside of the bag. 4. The thread used for sewing is coloured to make it hard to replace. 5. Most types of superglue leave a white residue on the PVC material utilized for the bags. 6. A clear window for sender/receiver information is only accessible from the inside of the bag. The window is made from clear vinyl and is ultrasonically welded on the bag. 7. The security seal can be laser marked with permanent sequential numbers. 8.The bags can be individually printed with company name and/or number for easy identification.